Interested in racing occasionally on a Cav 28? If so, get yourself on the Clip email list using this form. If you want, send the webmaster an email with your experience & we'll publish it on the site so prospective skippers can find out about you. If you are thinking of selling your Cavalier 28, three people have recently been in touch with the Association looking to buy one. If you are interested, please get in contact with the secretary (secretary@cavalier28.com) or at any of the addresses on the Contact Us page and we will put you in touch. The association charges a very reasonable brokerage fee for this service - upon the conclusion of a successful sale! Yachting enthusiasts keen on the concept of one design racing would be well advised to consider joining the racing program conducted by the Cavalier 28 Association on Sydney Harbour on alternate Saturday afternoons between September and March. 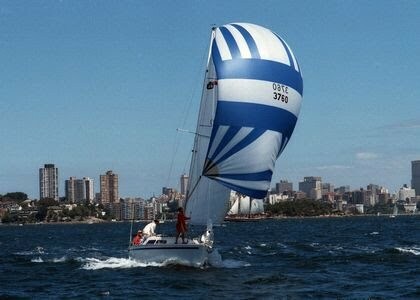 The racing program is conducted on behalf of the Association by the Sydney Amateur Sailing Club. Racing is at the present time conducted on alternate Saturdays although up until recent times the program involved racing every Saturday. Subject to demand and interest the program could be rescheduled for an every Saturday racing program. The racing fleet presently consists of approximately 12 boats who race each alternate Saturday and in addition to this program separate regattas by way of the State championships and the Audi Regatta are held with up to 14/15 entrants. The great advantage of racing with the Cavalier 28 Fleet is the relatively low entry cost to participate in highly competitive one design yacht racing. With an average price of a second hand Cavalier 28 standing below approximately $50,000.00 (more or less depending upon the condition of the yacht) it is very easy to see how the cost at this entry level is very significantly less than the cost of any similar sized one design cruiser/racer yacht in Australia. Crewing requirements for the Cavalier 28 are not demanding with the boats being capable of being raced with a crew of as few as 4 but usually 5 to 6. Sails and rigging are also within reasonable proportions with Class Rules prohibiting the more expensive carbon fibre and other exotic material blends. Second hand Cavalier 28s can from time to time be obtained through the Cavalier 28 Association who if requested to do so by an existing owner acts as a broker for a modest fee or any of the usual yacht broking organisations would have access to Cavalier 28s from time to time. The Association would welcome enquiries from any potentially interested yachting enthusiasts. Come and join the Fleet! Weather widgets kindly provided by Seabreeze. Click on images for more details. Please leave site feeback here - if only to let us know you stopped by!